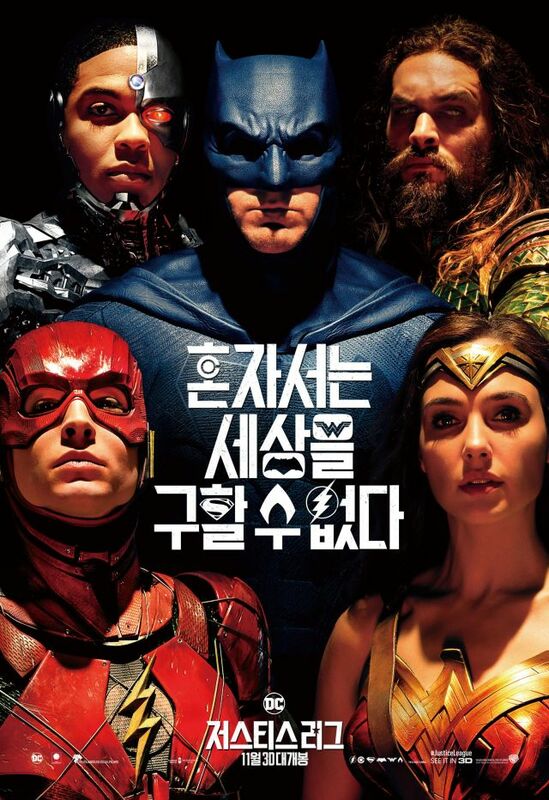 Zack Snyder's much-anticipated "Justice League" brings together five of DC's front-running superheroes - Batman, Superman, Wonder Woman, Flash, Aquaman and Cyborg - and it didn't come cheap: costing $300 million, "Justice League" is the most expensive superhero film ever produced, and, along with "Pirates of the Caribbean: At World's End", the second most expensive film overall. The film was released in Korea last Wednesday and quickly overthrew Marvel's latest, "Thor: Ragnarok", at the top of the chart. From 1,308 screens, Snyder's "Justice League" came away with 47.87% of the sales, or 818,401 admissions ($6.3 million). Last weekend's number one, "Thor: Ragnarok", was denied a fourth straight weekend at the top and fell two places to third. "Happy Death Day", the American slasher film, however, retained second place and added 289,493 admissions (16.39%) to bring its total tally in Korea now to just over a million ($7.58 million). Christopher B. Landon's "Happy Death Day" has been very lucrative for Universal Pictures: from a production budget of just $4.8 million, and since its release in the United States mid-October, the film has grossed an impressive $88.5 million. Taika Waititi's "Thor: Ragnarok", the seventeenth film in the Marvel Cinematic Universe, has been well received by both fans and critics alike. In Korea, the film has spent four weeks on the charts and banked $33.8 million, $1.2 million (167,550 admissions) of which was earned here. Waititi's refreshing take on the franchise requires another 400,000 admissions to overtake "Kingsman: The Golden Circle" to become the ninth highest-grossing film of the year in Korea. The highest new local entry was up next. "Room No.7" is a comedy thriller by Lee Yong-seung, his second feature-length film after "10 Minutes" (2014). While his first film only took in around 3,000 admissions, Lee's second film opened its account with 155,888 admissions (8.69%) from 562 screens. The film stars Shin Ha-kyun and Do Kyung-soo and asks what would happen if a dead body was found in a room in a DVD store. Chang You-jeong's "The Bros" (with Ma Dong-seok, Lee Dong-hwi, and Lee Honey) arrived on the scene earlier this month and claimed 70,755 admissions (3.83%) here, its third weekend, to move its total tally to 1.4 million ($10.4 million). "The Outlaws", which also stars the veteran action star Ma Dong-seok, this time alongside Yoon Kye-sang, competed during the long Chuseok holiday last month but is still soaking up stubs in the middle order. Kang Yoon-Sung's crime thriller claimed another 63,126 admissions (3.72%), putting it on 6.7 million and further securing its place as the fourth highest-grossing film of the year behind "Spider-Man: Homecoming" (7.2 million admissions: $53.7 million). After entering the fray last weekend in sixth, the biographical animated drama about the life of the famous painter Vincent van Gogh, "Loving Vincent" by directors Dorota Kobiela and Hugh Welchman, fell one place to seventh with 38,805 (2.2%), followed by Cho Young-jun's debut, "The Preparation" (starring Go Doo-shim and Kim Sung-kyun) with 18,152 (0.94%). Both "Loving Vincent" and "The Preparation" were released November 9, and currently, the films have earned $891,873 (121,641 admissions) and $870,658 (130,475) respectively. The last two films in the top ten this week were both from Japan: the anime film "Doubutsu Sentai Zyuohger vs. Ninninger: Message from the Future from Super Sentai" remained unmoved in ninth with 36,339 (1.81%), while "Let Me Eat Your Pancreas" fell five places to tenth with 35,257 (1.98%). [Photos + Video] Hope-filled trailer and new poster for "The Return"
[Video] Main trailer released for "A Lusty Wife's Double Life"